Smith & Deli is finally here. It has been worth the wait. I didn’t think it was possible to love something more than Smith & Daughters, but I do. I turned up at 8.15 am on the opening day thinking I might be able to dash in and grab something for breakfast. An Egg McMartinez perhaps? The place was buzzing, with a queue snaking its way to the door. I had to leave to do some volunteering so I headed out again, postponing my visit until 1.30pm. I joined it and spent my waiting time productively, collecting various goodies as I passed them on the way to the till. Like lollies at the checkout, I grabbed some shallot sourdough from Noisette bakery, some tortillas, a frozen chicken curry pie and spent a long time cruising the cakes and deli items for future reference. To my disappointment, the last vanilla slice disappeared before my eyes. Oh well, something to look forward to. I also had lots of time to admire the cute retro decor, perfect right down to the gingham shirts worn by the staff and Patsy Cline on the stereo. At the ordering station, staffed by the ever lovely Mo, I settled on a Home Alone sandwich. This might have been made for me, stuffed as it was with all the kinds of foods I love. Turkey, stuffing, roasted brussels sprouts, cranberry sauce, mashed potato and gravy. Utter, utter heaven. There were a couple of substitutions for my sandwich because they had run out of rolls and turkey. They subbed in turkish bread (fine by me, I love it) and chicken salad for the turkey. I don’t know what the original is like but this was fantastic. I cannot imagine a better sandwich. I got a bit teary as I ate it. I love sandwiches, but frankly our options are often limited at non vegan places to hummus and salad. The sandwich list here is 32 varieties long and runs over two blackboards and every damn one sounds fabulous. 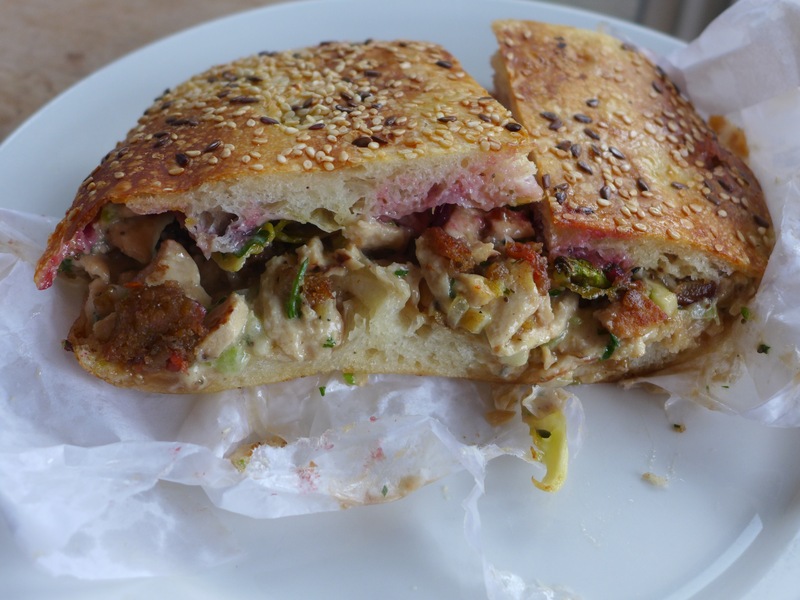 I plan to blog the entire sandwich list as part of Vegan MoFo 2015. As an unreformed pastry addict I also ordered a beef bourguignon pie. I confess I ate that as well as the sandwich. I am now very full. I had intended to take the pie home to eat, but I scoffed half on the drive home. 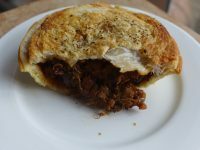 It was great, a rich buttery shortcrust pastry bottom with a flaky top, packed full of intense red wine, mushroom and beefy flavours. Even allowing for the fact that I think anything wrapped in pastry is special, this was a great pie. The sandwich, I did manage to wait until I got home. I can’t begin to describe how happy it made me. Just let me say that any sandwich that leaves you tearing up is special. But the joy doesn’t stop with sandwiches, cakes and pies. You can pick up take away meals, soups, pies, pizza, deli meats, cheeses and salads as well as dips, bread and all kinds of staples. Any other shop where you had to wait for food might make people a bit grumpy, but the vibe was so nice, people in the queue laughing and talking to each other. The cheerful staff keep the queue snaking around in an orderly fashion to get people in from out in the cold and they give helpful advice as to what items are available quickly if you are in a hurry. By day three (yes I went the first three days in a row) they had improved the wait time by taking sandwich orders in the queue so they are made (or almost made) by the time you reach the cash register. While I was waiting I had one man tell me he was so happy because he hadn’t had food like this for almost 20 years since becoming a vegan. We were almost a bit weepy. Thanks S&D for making my day so happy (and gluttonous). Note: I went again the next day and had a custard and quince danish. Crunchy, flaky, delicious. And the day after, another sandwich, the Temple of Doom. I’m stopping for a day or two now. I can’t wait for vegan mofo to read your reviews! Perhaps by then I will be familiar with a few of them – will do my best as a couple of visits have already wowed me. Smith and Deli is such a great concept and I hope they do well. The Home Alone is great (thanks for the recommendation) and I am now dreaming of making my own at home! I had the Rocky today– bloody awesome! In the interests of my waistline I am not eating them all in September! I am eating them all between now and Sep 30.